The Kamikaze (AKA: Ranger) first made its debut in 1984, by Italian manufacturers Far Fabbri and Sartori, based off ride movements previously found on the Eyerly Loop-O-plane. Since this time over 150 units have sold worldwide and similar copies have been made by almost every ride manufacturer in the industry. 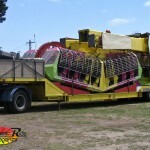 Its relative compactness (1 x 40ft trailer), high capacity (36 adults), dominant look (17.6m length / 18.4m height) and easy set up (4 hours with two workers) makes it a very appealing purchase for any travelling carnival owner. The original Fabbri Kamikaze does not rely on heavy counterweights, but instead a highly geared drive system making for a very fast upside-down, pendulum motion, swinging at speeds of 13 RPM, relying on momentum to keep it swinging. In more recent models, Fabbri have increased the length of the upper arm counterweights thereby creating a slower ride with less drive requirements. The ride movement gives feelings of seat-pining centrifugal force and head-rushing, blood-filling, upside-down moments varying in length, depending on the mood of the operator. There are currently 3 Kamikazes, and 2 Rangers travelling Australia. I rode the kamikaze again at the clark county fair here in springfield ohio. It was so fun. I like the feeling of hanging upside down. I always wonder how that ride actually works. Does it know when to flip on its own or do you have to press buttons and levers to tell the ride what direction to flip. I wouldn’t mind having a kamikaze in my back yard. It rocks. I wonder what are the three inversions that the kamikaze does? I have been riding this awesome ride for a long time, and the more I RIDE, THE MORE I WANT IT!!!!!!!! I do not have the money to buy it, but I have taken awesome pictures of the ride, and I love riding it. My favorite ride. THE KAMIKAZE IS SOOOOOOOOOOOOOOOOOOOOOOOOOOOOOOOOOOOOOOOOOOOOOOOOOOOOOOOOOOOOOOOOOOOOOOOOOOOOOOOOOOOOOOOOOOOOOOOOOOOOOOOOOO CUTE!!!!!!!!!!!!!!!!!!!! The Kamikaze is cute. And I am going to marry it. I went on this ride once. It was awesome! And scary! Then at another fair the guy controlling it was my friend. He let me control it! It was fun!! Then he had to do something and he said I will leave you in control. I said Ok. The people that were on it when I was controlling it loved me! Because I gave them 6 minutes instead of 2 minutes! Our company had the Sartori model from 1989 to 1995. Then traded it in for the Far Fabbri model. Then traded it again in 200o for the newer Fabbri floorless model called Footloose. A true money maker and fun ride. We run ours with strobes and fog. Awesome piece for any midway. These things are insane i like to eat llamas. i LOVE this ride its awesome the first time i rode it they had the harness too wide and i almost fell through the bars best day ever. I rode the kamikaze again this year and the same experience of this ride makes it fun. 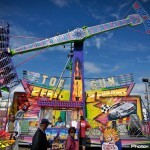 I am going to the ohio state fair in august and if they have this ride I will be riding it again. How many controls does that ride have? 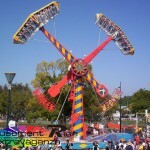 how old do you have to be to ride this im 11 years old and never been on this ride or for that matter any ride that goes up side down so is it scary and how old do u have to be. this ride is so fun. I went on stoned and tripped the hell out. so awesome. we have 2 in new Zealand. 1 in the north island. and 1 down south. Rode this ride at the county fair one time, was fitted pretty loose in seat, apparently is how it is supposed to be. On the upside down part of the ride but came completely off the seat and shoulders pressed against shoulder bars pretty tight made me angry and depressed at the same time. Sometimes ride hangs you upside down for long periods of like 5 to 10 seconds felt like I could fall out if bars failed me and face felt like concrete the blood rush was so bad. Got sick from the bad mood it put me in. Riders beware! Rode this ride at the county fair one time, was fitted pretty loose in seat, apparently is how it is supposed to be. On the upside down part of the ride but came completely off the seat and shoulders pressed against shoulder bars pretty tight made me angry and depressed at the same time. Sometimes ride hangs you upside down for long periods of like 5 to 10 seconds felt like I could fall out if bars failed me and head felt like concrete the blood rush was so bad. Got sick from the bad mood it put me in. Riders beware! i have never ride it before but i love this ride!! 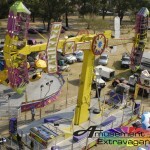 Okay so I went on this ride at my home town carnival for the first time and it was so fun I couldn’t believe it. The first time I went I got stuck next to a screamer and wow was she loud. OMG!! I loved this ride, but one day I went on it and the thing that holds you in didn’t work on my seat and I could lift it up over my head btw I was only nine at the time so it was scary! I had to hold myself in the ride so that I didn’t fall out and I was freaking out which didn’t help much, but I had a friend with me and she was trying to calm me down. After I got off I told the guy working the ride that my thing that holds me in is broken and all he said was “oh, okay I will look at it” I don’t think he really cared but I cried after! So if you go on this ride have fun and good luck! At my county fair it’s called the moonraker. 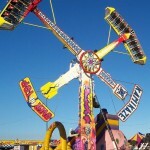 Went on this with my bro’n’law at the Ayer’s Cliff fair near Montreal. we are both big boyz and squeeezed into our seats. I thought it was going to be awesome, he wasn’t so sure…5 minutes late we we’re dangling upside down, which was cool. 5 minutes after that I was thinking about losing my lunch on him – sausages and lemonade. Fun, but I shant do that again. I rode this with my boyfriend last weekend, I had a panic attack, hurt my shoulders, and it made my hips sore. He was laughing the entire time while I was crying and screaming. It wasn’t a fun experience. I might do it again, but I really doubt it. This and the Super Loop (aka Ring of Fire) are two of my favorites. I got a friend of mine on this one and he wouldn’t talk to me for about fifteen minutes afterward(I guess because it scared him so bad). Lot of fun, at least to me. Hi there,I read your new stuff named “Kamikaze – Amusement Ride Extravaganza” on a regular basis.Your humoristic style is witty, keep it up! And you can look our website about ????????. if this ride’s like the Sky Master. then I’d like this one. I’ve ridden the sky master. Scarey at first but fun! I love this ride strictly maintained respectful operators and deck hands the Ranger is the ride of thrills. Just a glimpse of the Kamikaze will keep someone(like me) away .